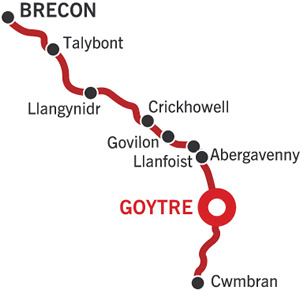 Cruise through the spectacular Brecon Beacons in the National park, follow the River Usk & its pretty valley as the canal clings to the hillside in this mountainous region. Brecon Beacons is a National Park of over 519 square miles of mountain and hill country, and virtually all the canal is in the Park, a rich diversity of wildlife and walks. There is a restaurant and bar in the marina. Abergavenny is a picturesque town situated in the South Eastern corner of Wales, only 20 miles from the English border. It lies beside the fast flowing River Usk & is steeped in history and enjoys an enviable position bathing in the beauty of the Brecon Beacons national park- Sugar Loaf, Blorenge & the Skirrids overlook the town. The museum & castle are in Castle street, the mound of the castle dominates the town. It was built in the 11th century and now houses the museum which tells the story of the town from prehistoric to modern times. Through the village of Llangattock, about a mile from the canal, is the lovely town of Crickhowell. To the south the town is bounded by the River Usk which has a 16th century 13 arch bridge across it , to the north are the Black Mountains, the eastern range of the Brecon Beacons national park, this area is a good base for exploring the Brecon Beacons. There are opportunities for caving in the surrounding hills, and easy or strenuous walking, also horses can be hired from Golden castle Riding stables in Llangattock. It is 3 hours cruising from Llanfoist wharf to here. The Llangynidr flight of 5 starts just after bridge 132. By bridge 131 there is a useful shop. The locks mark the beginning of the short climb to Brecon, and thick woods surround the final three, the locks should always be left empty with the bottom gates open when you have gone through them. There is a pleasant picnic area in the shade of the woodland. 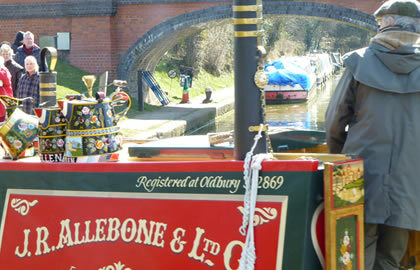 Canalside at bridge 133 is the Coach & Horses, an attractive pub in the small hamlet of Cwmcrawnon, tel 01874-730245. Just before Talybont on Usk there is a short tunnel of 375 yards, you can moor near the bridges, there are 3 pubs in the village and a Po & stores at bridge 144. Talybont is a quiet holiday centre with facilities for fishing, pony trekking, mountain biking and hill walking, details of which can be obtained from the Talybont Venture centre in the village. The large wharf overlooks the village, which is clustered around the Caerfanell aqueduct. It is 7.5 hours to here from Llanfoist. At the end of the village is an electronic lift bridge, instructions are clearly posted. There are 3 lift bridges on this section, which are sometimes fixed in the open position to stop livestock crossing, they should always be left as you find them. dominates the village. There is a canalside pub by bridge 153 – the Royal oak. the White Swan is a 300 year old pub in the village. In 1775 mosaics & a villa bathhouse were uncovered dating back to the 5th century, parts of which are on display in the national Museum of Wales in Cardiff. North of bridge 163 is the Three Horseshoes pub. On the final mile into Brecon the canal is high on the hillside, with the River Usk below. The entry into Brecon is attractive with many pretty houses & gardens flanking the canal. The canal ends in the Theatre Basin, where you can moor, or turn your boat. Brecon is a busy market town, with a fine 13th century cathedral. The Cathedral New heritage centre is in the beautiful cathedral close and houses n exhibition on cathedral life. Brecknock museum in Glamorgan street includes a large archaeology from pre-roman to medieval times. The South Wales Borderers museum is housed in the Barracks, and gives a history of the 2 famous regiments over 200 years. In the Theatre basin overlooking the canal, is the Theatre Brycheiniog, which plays host to many touring productions. It is 4 hours from Talybont to here. After lunch it is time to head south back to the marina, perhaps stopping at Pencelli as an overnight stop which is 3 hours cruising from Brecon. It is about 11.5 hours back to the marina, so you will need to head south for as far as you can today, perhaps stopping after Llanfoist and then giving yourself about an hours cruising on the last morning.